The NFC North Champion Green Bay Packers will host the New York Giants at Lambeau Field on Sunday afternoon. The contest will be televised on FOX with a start time of 4:40 PM EST. Vegas odds opened with the Packers listed as a 4.5 point favorite with the total set at 44.5 points. The wagers have come in fairly even on the two sides (NYG 54%/ GB 46%) but the money seem to favor Green Bay indicating a small reverse line movement as the books have moved the spread to Packers -5.5. The total has moved to 45 points with 68% of the public believing there will be enough scoring to go around and are backing the over. The Giants (11-5; 9-6-1 ATS; 4-12 O/U) had already clinched a playoff spot heading into Week 17, but that did not stop them from playing spoiler in a 19-10 win to eliminate the Redskins from playoff contention. New York has won nine of its last 11 games straight up (8-3 ATS) with the two losses at Pittsburgh and Philadelphia. They’ve played excellent defense all season long but really stepped up down the stretch and allowed only 11.8 points per game through their last four games. 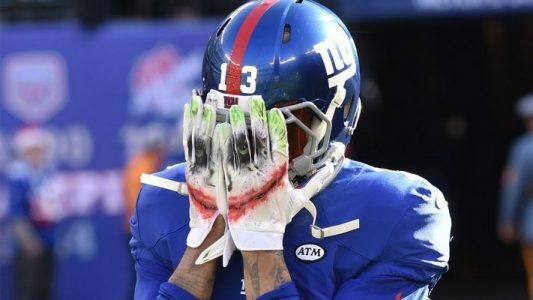 On offense, the Giants have yet to score over 28 points in a contest this season and they come in ranked 25th in total offense averaging 330.7 yards per game and 26th in the NFL at 19.4 points per game. Quarterback Eli Manning has had a decent year, throwing for 4027 yards and 26 touchdowns, but he’s been intercepted 16 times. He tossed six interceptions over his last five games which must be a bit of a concern for the Giants. Wide receiver Odell Beckham Jr. has racked up 1367 receiving yards with ten touchdowns, averaging 13.5 yards per catch. The Giants does not pose much of a threat on the ground with their 29th ranked rushing attack and leading rusher Rashad Jennings has just 593 yards and three scores averaging 3.3 yards per carry. The Giants are 9-0 ATS in their last nine playoff road games but 1-8-2 ATS in their last 11 road games vs. a team with a winning home record. Under is 7-1 in the Giants last eight games overall. The Packers (10-6; 9-6-1 ATS; 10-6 O/U) won their final six games of the regular season to win the NFC North. They secured the title with a 31-24 win at Detroit in Week 17, their fourth straight game scoring 30+ points, and quarterback Aaron Rodgers threw for 300 yards and four touchdowns on 27-of-39 passing. Rodgers leads all QB’s in passing touchdowns and finished the regular season with 4428 yards and a dominant 40:7 TD to INT ratio. Wide receiver Jordy Nelson has had a great season racking up 100+ receiving yards in four of his last eight games, and the 31-year old finished the season with a team-leading 1257 receiving yards. The Packers running backs have been banged up all season and they’ll definitely have to rely on their passing game here in the NFC Wild Card Game. Green Bay has struggled on the defensive side of the ball all season and ranks 22nd in total offense allowed at 363.9 yards per game, 31st against the pass, 8th against the run and 21st in points allowed, surrendering 24.2 points per game. The Packers are 5-1 ATS in their last six games overall while the over is 4-0 in their last four games overall. The Packers beat the Giants 23-16 as a 7-point favorite here at Lambeau Field in Week 5. Aaron Rodgers threw for 259 yards with a pair of TDs and two INTs while Eli Manning completed just 18-of-35 passes for 199 passing yards with one touchdown. The Giants are now 4-0-1 ATS in their last five meetings while the home team is 4-1-1 ATS in their last six meetings. We believe the Giants defense will do enough to keep them in this game, and Eli Manning should have plenty of success against the Packers vulnerable secondary.